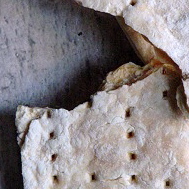 [%image cracker float=left width=150] Some may wonder at the desire for the subsistence food known as hardtack. But the crackers made and sold by Bent's Cookie Factory are big with tough Yankees, Civil War re-enactors, and Culinate's own Matthew Amster-Burton. Iggy’s Bread of the World makes and sells artisanal breads, such as a crustless pain de mie and dense, seeded bagels. Mail orders are limited to breads — made in special four-pound loaves — that the bakers think will hold up well. By the time most chocolate gets from cacao tree to you, it has had a lot done to it, from roasting to grinding to conching to having other ingredients added. Taza Chocolates skips most of that, producing stone-ground chocolate that is some of the simplest and most pure chocolate you can buy. block(clear green). Have a favorite regional specialty from Massachusetts? Share it in the comments section below.